Here's something I found online: the UK wrapper for THE BLACK HOLE Bubble Gum Card, published by Topps around 1979-80. As far as I know, the 88 cards were the same as the US release... but we didn't get the stickers. I remember collecting these (along with the blue-boardered STAR WARS and BATTLESTAR GALACTICA sets) courtesy of the local market stall. 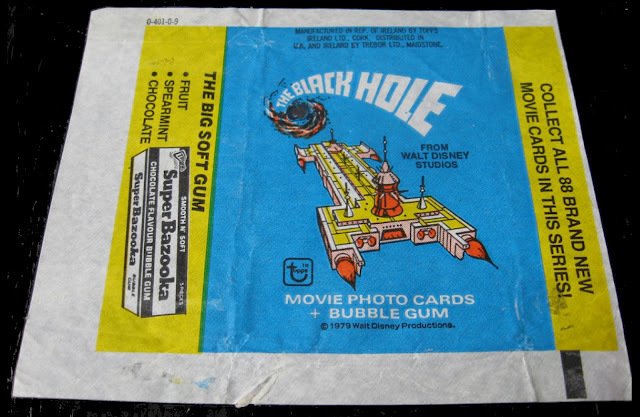 Even then, it was considered madness to actually consume the pinkish strip of gum which always bonded itself to the top card.